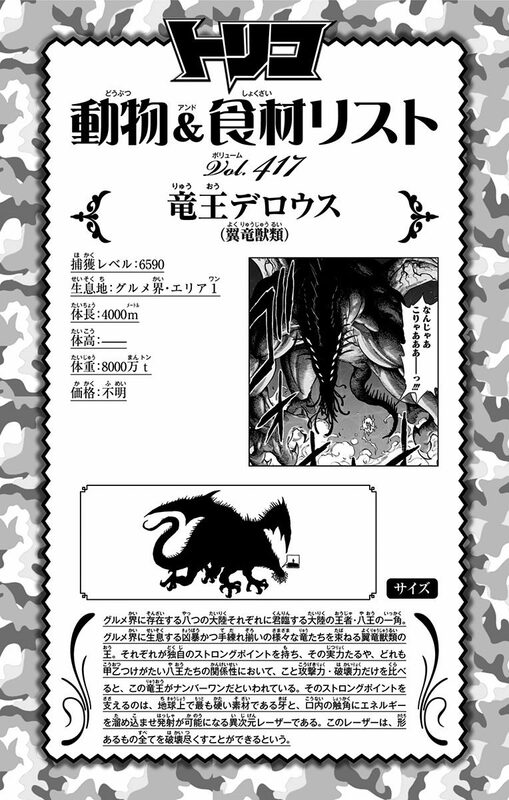 Derous (デロウス, Derousu) was a powerful species of dragons from the world's distant past. It was said to be the strongest dragon to have ever lived, using the power of its single, mighty fang to rule the world. The Derous is thought to have lived for ten thousand years. True to its status as an ancient ruler, a Derous is one of the mighty Eight Kings, the eight most powerful species in the world, which ruled Area 1 of Gourmet World. His Extra-dimensional laser was superior to both Joa Sky Cut and Neo consuming power which can easily do this. Extra-Dimensional Laser: It performs this attack by generating energy on the tips of each of its tongues, which then gather into a sphere of energy in front of it before it gets discharged into a powerful singular energy beam. The sheer strength and speed of this attack is so immense that even NEO itself is unable to eat the attack in terms of countering it, and the attack itself is long lasting enough to exceed Earth's boundary and reach the far edges of outer space, destroying asteroids along the way in its path. When charging up every ounce of its power, it even has the capacity to kill Whale King Moon.